I had the best Americano I've ever had on the opening day of Sam James Coffee Bar. 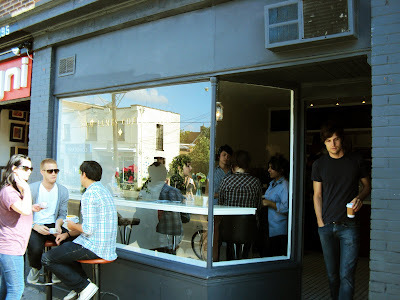 This small coffee bar is packed with locals and you can witness some great barista action by Sam himself. Zereshk: soak the zereshk in water for 30 minutes. Drain, cook in low heat in a pan with sugar and butter until soft and caramelized. Add 3-4 tbsp of saffron water mixture. Polo: wash the rice. add to salted boiling water. once cooked (it should still have a bite) drain. add 3-4 tbsp of saffron water and some oil to the bottom of the pot, transfer the rice back to the pot. Let it cook, covered with a cloth for 30-40 minutes on low heat. This causes the rice in the bottom of the pot to harden and make a nice crispy "tahdeeg". Take a cup of rice and mix with some saffron water for garnish. Melt the chocolate and butter in a double boiler. Add the coffee and mix well. Let the mixture cool down. Add the egg yolks one by one and mix well. Beat the egg whites until you can flip and hold the bowl on top of your head! Add 1/3 of the egg white to the chocolate mixture and fold gently. Don't be harsh! continue until the egg whites are all mixed in. Do the same with the cream. Pour the mousse into individual cups. Put in the fridge for at least 6 hours before serving. This was the first time I made chocolate mousse. Next time I will try to tweak the recipe a bit and take more pictures of the whole process. Boil the mini red potatoes, starting with cold salted water. Cook until fork tender (not too tender). Once cooked, halve the potatoes and season with salt and pepper while still hot. Let the potatoes cool down. Steam the green beans for 5-7 minutes. Once done, shock them in iced water. Make the dressing: 3 tbsp of dijon mustered, 2 tbsp of olive oil, 1 tbsp of lemon juice, salt and pepper. When beans and potatoes have cooled a bit, toss them together with dressing. Marinate the chicken breast in olive oil, lemon, salt, pepper and cilantro. Fry in some olive oil, 3 minutes each side. Add a nub of butter and baste the top of the breast a bit. Roast in the preheated oven for 11-13 minutes. Take out of the oven and let it rest. Assemble the whole thing ... add some goat cheese, greens and tomatoes ... then eat and enjoy! Cook the rice according to the instructions. Once cooked, let it cool and then add some olive oil, chopped cilantro and half a lime juice + zest. Chop all the vegetables. Cook in a pan (olive oil) with bell pepper and shallot in first. Season with salt, pepper and chipotle pepper. After 2 minutes, add corn and cover for 3 minutes. Add mushrooms and let cook until the corn is almost cooked. Adjust the seasoning and also add some chopped cilantro stalks and lime juice/zest and the black beans. rub the pork with olive oil, salt, pepper, smoked chipotle pepper. leave in the fridge for a couple of hours, take out of the fridge and leave for 10 minutes. fry the loin in medium high heat to create a nice crust (2 minutes each side), bake in the preheated 350 oven for 15 - 20 minutes (if you are cooking a full tenderloin, cook for 20 - 25 minutes). Let rest for 5 to 10 minutes. Once everything is ready, assemble the burrito, bake in the 350 oven until the tortilla is a bit crunchy. Serve with a side of guacamole and some salad. Blue Bottle Cafe. The best cafe on earth! unfortunately we were late to taste the amazing coffee from the $20,000 Japanese siphon bar (read this article and check out the slide show: http://www.nytimes.com/2008/01/23/dining/23coff.html?_r=1). They stop making them after 4 p.m., but we could get some amazing lattés. The communal table, the minimal decor and the laboratory style coffee machine made this one of my most exciting coffee shop experiences.